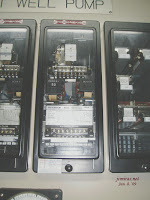 Electromechanical relays are used in power system, specifically in its protection. These are switching devices used to control high power devices. They have earned a well-deserved reputation for accuracy, dependability, and reliability. Electromechanical relays come in many forms, but there are two basic types of operating mechanisms: the electromagnetic-attraction relay and the electromagnetic-induction relay. 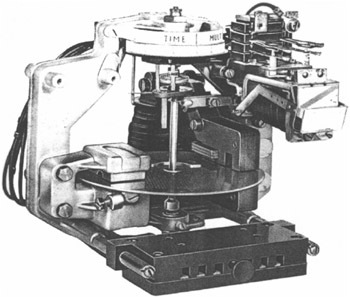 Of the two, the more popular type of electromechanical relay is the induction disk in which a disk is mounted on bearings and is put in motion by the 'induced' field from an electromagnet. The speed of rotation is controlled by a fixed magnetic field from a permanent magnet. The moving element, or rotor, is usually a metal disk, although it sometimes may be a metal cylinder or cup. The stator is one or more electromagnets with current or potential coils that induce currents in the disk, causing it to rotate. The disk motion is restrained by a spring until the rotational forces are sufficient to turn the disk and bring its moving contact against the stationary contact, thus closing the circuit the relay is controlling. The greater the fault being sensed, the greater the current in the coils, and the faster the disk rotates. Magnetic-attraction relays have either a solenoid that pulls in a plunger, or one or more electromagnets that attract a hinged armature. When the magnetic force is sufficient to overcome the restraining spring, the movable element begins to travel, and continues until the contact close or the magnetic force is removed. The pickup point is the current or voltage at which the plunger or armature begins to move and, in a switchgear relay, the pickup value can be set very precisely. Electromechanical relays have found a decline in usage in recent times. This is due mainly to the advent of technology and the creation of digital, microprocessors based, and logic circuit centered relays. Electromechanical relays still has its supporters and advocates. GE for instance, despite being at the forefront of the movement to intelligent electronic devices (IEDs) and high speed communications, still firmly committed to the older and still viable electromechanical and static protective relay market. They believe that there are reasons to stay in the electromechanical protective relay game, as there are a number of applications where functional considerations can and do justify continued usage of these devices. There are still applications where single function redundancy is a factor or where digital relays are unable to function at their best, such as in harsh environmental conditions, or areas prone to electromagnetic (EMI) or radio frequency interference (RFI). Engineers at GE noted that there are special applications where nothing will do but an electromechanical relay, especially those in which customers have existing investments. Retrofitting- Situations where aging electromechanical equipment needs replacing, many users prefer to work with the existing technology rather than going to the trouble and expense of redesigning their drawings or facilities to incorporate digital technology. Retrofits in fact account for the largest portion of the electromechanical relay business. Harsh Environments - Under conditions of extreme heat for example, electromechanical relays are more reliable, easy to repair, simple to understand, simple to test, and simple to maintain. By way of example, any applications where the ambient temperature is over 80°C pretty well rule out the use of digital relays (e.g. oil fields in hotter climates). Electromechanical relays perform well in areas prone to electromagnetic interference (EMI) and radio frequency interference (RFI), they are a popular choice in harsh EMI and RFI environments. 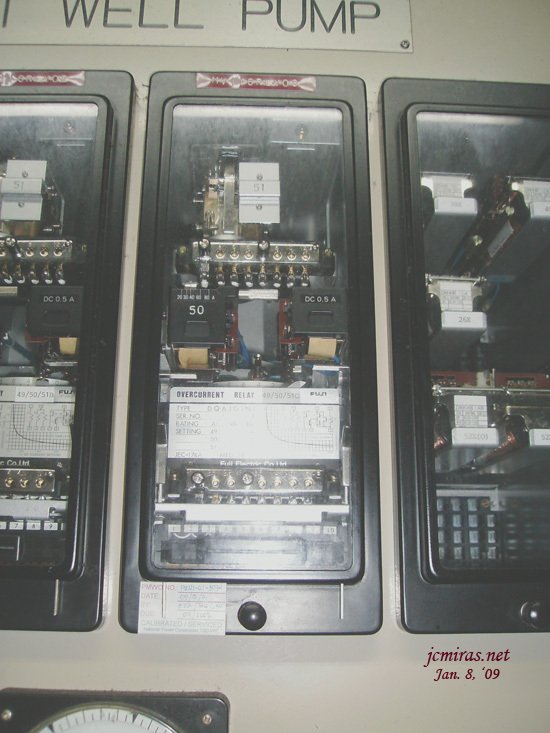 Surges, transients and noise do not affect an electromechanical protective relay. Self-powered - Digital relays require the presence of a secure power supply. When dealing with central power facilities, where a large battery is always present, this is essentially a non-issue. However, in areas where it is inconvenient to provide a battery, such as a smaller industrial environment or mining operation, that's a supreme justification for going with electro-magnetic relays. Every time you go and see your switchgear, and see all the digital relays, let us remember that once upon a time, the analogs rule the world of relaying. They are indeed a creation that made it throught the tests of time.